WAFFLES: I'm the Kitchen Counter Convict. KATIE: I'M the Kitchen Counter Convict. Who's the REAL Kitchen Counter Convict??? Yesterday, blog readers deliberated a full 24 hours before finding Waffles guilty of crimes against countertops. The decision was not however unanimous and the case has been declared a mistrial. The rules of Double Jeopardy dictate that neither Katie nor Waffles may be tried of this crime again. Regardless of whodunnit, both cats walk. In a shocking turn of events, TWO cats are now confessing to the countertop crime. 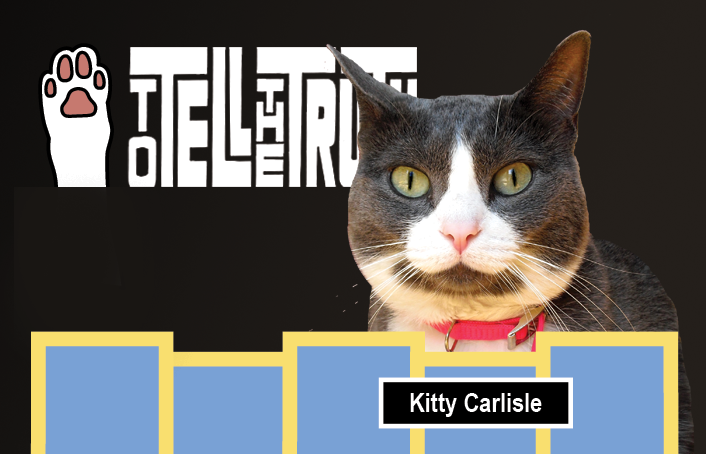 In an effort to find the REAL truth behind this mystery, celebrity game show cat Kitty Carlisle (a.k.a Allie from A Tonk's Tail) has been brought in to question these so-called criminals. 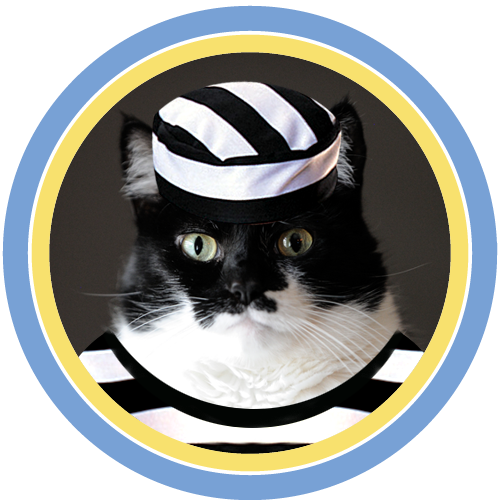 KITTY CARLISLE: Uh, Convict #1... Mr. Waffles is it? Why did you jump on the kitchen counter? WAFFLES: Um, the chicken treats. I was trying to open the jar of chicken treats. But it was MY jar. The chicken treats. KITTY CARLISLE: Mr. Waffles. Isn't it true that the chicken treats are kept INSIDE the kitchen cupboard and not ON the countertop? WAFFLES: Oh yeah. And I'm not supposed to open the doors or go inside. I get in trouble whenever I eat all the treats and leave the doors open. 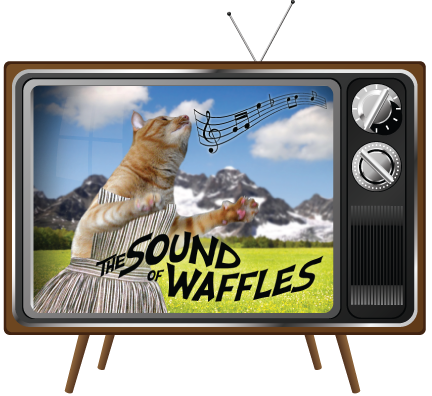 KITTY CARLISLE: I see, Mr. Waffles. It doesn't sound to me as though you were on TOP of the counter. Not that I don't think you're capable of jumping that high. WAFFLES: Thanks, Miss Kitty. I work out you know. KITTY CARLISLE: And Convict #2, Miss Katie I believe. 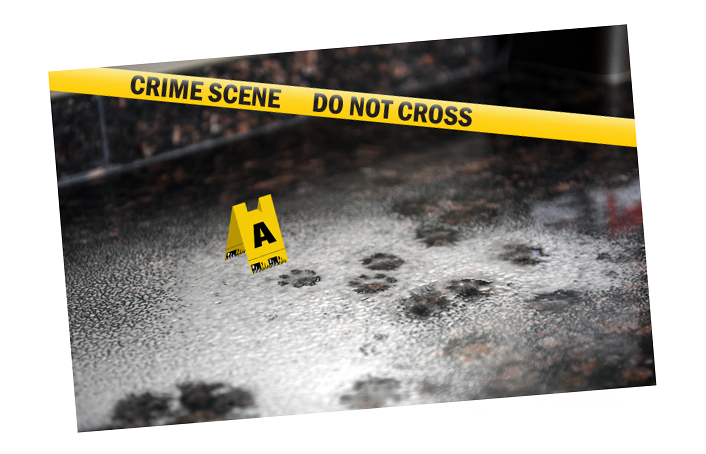 Is it true you tried to frame Mr. Waffles for these so-called countertop crimes? KATIE: I never said Waffles jumped on the counter. Everyone just assumed it was him. I can't help it if he's got a reputation for getting in trouble. That's HIS problem. KITTY CARLISLE: But Miss Katie, you have a reputation for being such a well-mannered lady cat. Isn't that right? KATIE: And smart. You forgot smart. KITTY CARLISLE: Miss Katie, did YOU jump on the kitchen counter? KATIE: It's a counter. I'm a cat. What can I say? 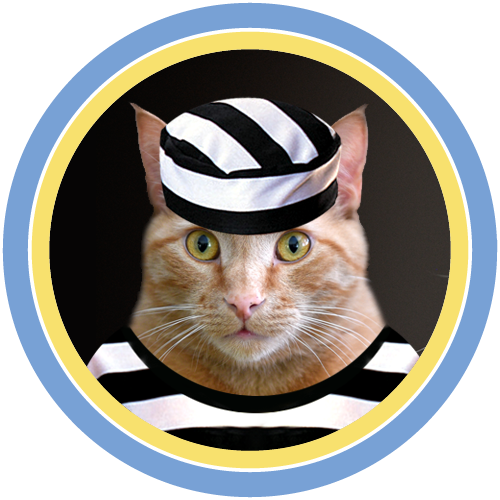 KITTY CARLISLE: Well I guess this WAS the purr-fect crime, now wasn't it! Allie's photo courtesy of Lisa Richman, A Tonk's Tail. 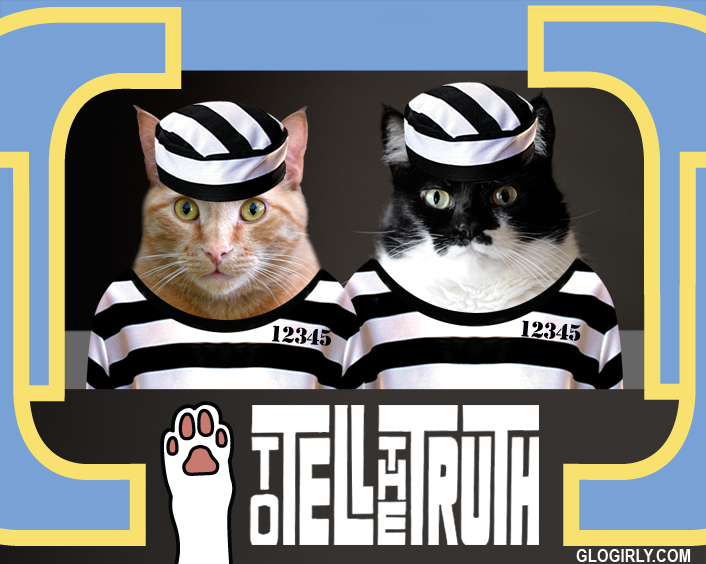 Fortunately we're cats, so we get to make stuff up as we go. Just like on TV. You guys are purrfect ! I can see Katie becoming an Attorney at Claw! I'm so glad Allie was able to get to the truth. She's a smart kitty! MOL, it's a counter, she's a cat, 'nuff said! Love it! Good job Allie, I mean, Kitty!, in getting the confession! I TOLD my human it wasn't me! Believe it or not ? I probably only kitty who don't do top of kitchen counter ! ...serious ! MOL, we knew it was Katie. The crime was very clever, just like her. Scylla gets blamed for everything around here even when she is INNOCENT. Dang Katie, you pulled of a good one girl! Cats and counters... that's just how it is. Bylaw number IIVVVXXXX.VII, subsection b.32954, point xxii. Any cat knows that... Purrs from Deb and the Zee/Zoey kitties! We KNEW we were right!! Those dainty paw prints told us. Allie: I swore to remain an impartial Inquisitor - completely objective. But it was OBVIOUS to me from the first moment that Katie was clearly within her rights. *thumps gavel* CASE CLOSED! Counter tops! The forbidden territory for cats! Lets take back the counter tops!!!! This gets deeper and deeper and the mystery grows. I knew Waffles was innocent. Make sure next time you don't leave any prints Katie. Wink, wink. Oh, how shocking! What if Waffles had been convicted? I'd my money on Katie only because the paw prints looked so perfect. In our house teeny paw prints belong to the girlie with the cocktail stick paws and the jumbo paws are the preserve of the ginger teddy bear. We'd have been a rotten jury, although we were right in the end our reasoning was prejudiced. MOL! We know it was both of them! I knew it couldn't have been you Waffles! I knew you didn't do it Waffles, to bad Miss Katie can't be punished. You'll have to keep an eye on Miss Katie now that she's shown us her bad side. I think you both are guilty ! You are both guilty...of being cute! The counter probably needed an inspection by you two anyhow. I’m allowed to go anywhere in the house except the furnace room and sometimes I get in there too. It shouldn’t be a crime to jump on the countertop. I’m just meowin’. I am no expert on counter-surfing as I couldn't pop up on a chair much less a kitchen counter BUTTT I think both of those kitty faces have "GUILTY" written all over them. Yep......I see wide eyes and total mischief on both faces. I think it may have been a "joint venture"........have the pawprints been looked at by an expert? I'm thinking there are TWO SETS.....that's my story and I'm sticking with it! OK..I now believe it was both of you..very clever Katie..you knew Waffles would get the blame because of his reputation..right?..and Miss Kitty/Allie Carlisle you did a wonderful job questioning these two purrpurrtrators..I also love the up-side-down heart on your nose my dear..
Allie: *giggle* ooooh THANK you!